WE COMMEMORATE THE 1 December every year in commemoration of EMANCIPATION DAY, the day all slaves were free men in South Africa, 1 December 1838. Here is a simple timeline on the development of slavery in the colonies. Chamber Representatives of the Netherlands Parliament grant a founding charter to the Dutch East India Company to establish an Indian trading empire in the East. Abraham van Batavia, the first slave, arrives at the Cape. Before the first shipment of slaves in 1658, a hand full off slaves had already arrived in the Cape with their ‘owners’. By 1658 there were 11 slaves, 8 women and 3 men at the Cape. One of these, Abraham, was a stowaway who, in 1653, arrived from the East aboard the ship Malacca, claiming to have run away from his master, Cornelis Lichthart of Batavia. Abraham was set to work at the Cape. A slaving voyage is undertaken from the Cape via Mauritius to Madagascar. Farms granted to Dutch free burghers (ex-Company soldiers). The first shipload of slaves are brought to the Cape, from Angola on-board the ship, the Amersfoort. Slaves helped built the Castle – Fort Good Hope. Foundations laid for the Company Slave Lodge. 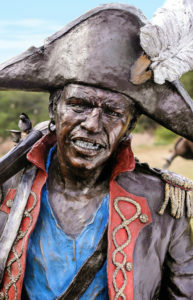 Free burghers petition for slave trade to be opened to free enterprise. Government directive restricting male slaves being brought from the East. Dutch East India Company ends assisted immigration from Europe and retains the institution of slavery as the main labour system for the Cape. 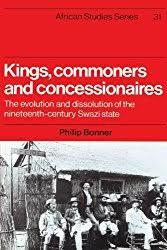 Free burghers petition again for slave trade to be opened to free enterprise. Slave post established Lourenco Marques by Dutch. Evidence that runaway slaves have been living at the mountainous Hangklip for extensive periods, between Gordons Bay and Kleinmond/Hermanus. Maputo slave post abandoned due to mutiny. The Moravian Church started their first mission station at Baviaans-kloof, now known as Genadendal in the Swellendam district. Governor Rijk Tulbagh codifies slave law. A census taken of the Cape colony at the time showed the two populations, both slaves and settlers to be roughly equal to about 6000 each. Abolition of importation of male slaves from Asia. Government directive abolishing the importation of male slaves from Asia repeated. Government directive abolishing the importation of male slaves from Asia repeated again. Slave trade opened to free enterprise. The Moravian Missionary Society re-established their first mission station, Genadendal in the Swellendam district. The British takes over control of the Cape and remain in charge throughout the 19th century. The British outlaws torture and some of the most brutal forms of capital punishments. Dutch temporarily re-occupy the Cape of Good Hope (Short three years, see Batavian Republic). Britain occupies the Cape again. Company slaves are released from the Slave Lodge under rule of the then Governor, the Earl of Caledon. Mission station at Groene-kloof [Mamre] near Malmesbury. This former military outpost on the farm, Louwplaas was offered by the British government to the Moravian Missionary Society for the establishment of a mission station. There are more than 5 000 people living at Mamre today. Britain passes Abolition of Slave Trade Act, outlawing the Trans-Indian Oceanic slave trade. It was now illegal to be a slave trader buying or selling slaves, but it was still legal to own slaves. 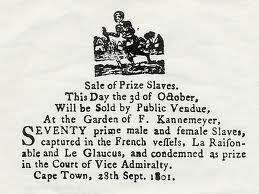 Prohibition on the importation of overseas slaves resulted in increasing the exchange value of Cape born Creole slaves. Britain enforces the Abolition of Slave Trade Act, ending the external slave trade. Slaves can now be traded only within the colony. The Koeberg slave rebellion in the Swartland near Malmesbury, led by Louis of Mauritius, is defeated at Salt River. Resulted in the capturing of 300 farm slaves as dissidents. The London Missionary Society was invited by the leader of the local Khoi i.e. the Attaquas tribe to establish a mission station. Thus the mission station, Zuurbraak was established at the foot of Tradouw Pass. The London Missionary Society sponsored missionary, Rev Charles Pacalt who established this small mission station a few miles south of George. Pacaltsdorp, presently a vibrant ‘Cape Coloured’ town outside George in the Southern Cape. Het Gesticht, the fourth oldest church building in South Africa and erected in 1813 by the inhabitants of Paarl as a meeting house for non-Christian slaves and heathen in the town. The Paarl Missionary Society took over the administration of Het Gesticht. It has been proclaimed a National Monument, and serves nowadays as a museum for the South African Mission Foundation. Fiscal Dennyson codifies the Cape Slave Law. 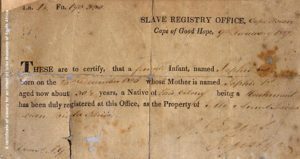 The British House of Commons discusses the conditions of slaves at the Cape of Good Hope by appointing a parliamentary commission of enquiry due to relentless pressure of the Anti-Slavery Abolitionists lobby. Appointment of two Crown Commissioners, visiting the Cape of Good Hope – including the various mission settlements – to investigate slavery at the Cape. A second slave uprising at the farm, Hou-den-Bek, led by Galant van die Kaap, is defeated in the Koue Bokkeveld, near Ceres. The Colonial Office intervened by forcing local colonial assemblies to bring the local amelioration legislation such Ordinance 19 of 1826 promulgated at the Cape, into line with the Trinidad Order aimed at the sugar plantation slave owners. Thus the British introduced ameliorisation laws in order to improve the living conditions of slaves as well as a a series of practical ameliorisation measures to make punishments less cruel, and the Office of the Protector of Slaves is established with Assistant Slave Protectors in rural towns and villages away from Cape Town. Collapse of the Cape wine industry. 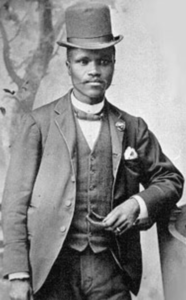 Coloured Persons qualified for the municipal franchise of Cape Town, and a Malay property owner was elected as Wardmaster. 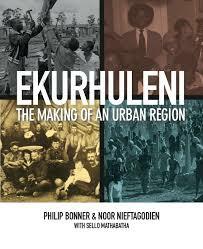 Ordinance 50 of 1828 liberated Khoisan into the category on par with Free Blacks and placed all Free Black persons i.e. both Hottentots and Vrye Swartes on equal legal footing with White colonists within the judiciary system. The two Rhenish missionaries, J G Leipoldt and T. von Wurmb jointly bought a farm Rietmond on the Tratra River in the Cedarberg District. The Rhenish Missionary Society started several industries, including the well-known shoe making factory at the Wupperthal mission station. Slave owners have to start keeping a record of punishments. Revised provisions of Ordinance 19 by the British Parliament resulted in the renamed Office of the Protector of Slaves. Stellenbosch slave owners rioted by refusing to accept this order to keep registers of slave punishments. More than 2000 slave owners assembled in Cape Town to hold a protest meeting demonstrating against this government order which was adopted without proper consultation. The Rhenish Mission Society ensured that a mission chapel was built and completed in 1833. As a result the Headquarters of the Rhenish Mission Society relocated from Steinthal near Tulbach to Worcester. Emancipation Decree issued in London. Slavery is abolished in British colonies on 01 December, liberated slaves now falls into the category of Free Blacks, although the ‘freed’ slaves are forced to serve an extended four year apprenticeship to make them ‘fit for freedom’. The Cape farmers faced prolonged weather conditions of drought. The Berlin Missionary Society established a mission at Bethanie. Ordinance No. 1 of 1835 introduced the terms of apprenticeship at the Cape, including the appointment of special magistrates. Start of the Great Trek by 12 000 frontier farmers, who demonstrated their unhappiness about the government’s policy to release slaves from the control of Free Burghers as slaveholders. Non-Whites were finally accorded similar treatment like White colonists in their interaction with the public institutions of the local authorities. End of slave “apprenticeship”. About 39 000 slaves are freed on Emancipation Day, 1 December 1838. Only 1,2 million pounds paid out against the original estimated compensation amount of 3 milion pounds which were initially set aside by the British government in compensation monies for the about 1 300 affected slaveholding farmers at the Cape Good Hope. The Moravian Missionary Society acquired the farm, Vogelstruyskraal near Cape Agulhas in the Caledon District. The newly established mission station was named Elim. Today, the town of Elim has a population of 2000 inhabitants. Masters and Servants Ordinance regularising and criminalizing labour relationships between employer and employee in favour of the former slave masters based on the past CAPE SLAVE CODES originally issued by the VOC as Placaaten of India. DID YOU KNOW: The song became a pan-African liberation anthem and was later adopted as the national anthem of five countries in Africa including Zambia, Tanzania, Namibia and Zimbabwe after independence. Zimbabwe and Namibia have since adopted new national anthems. 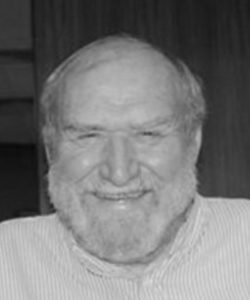 We here at the National Heritage Monument heard with great sadness that our esteemed colleague and respected historical advisor Professor Phil Bonner passed away on Sunday, 24 September 2017. It was national Heritage Day – a striking coincidence that would not have been lost on Prof, in fact, no doubt he would have chuckled at that. Professor Bonner was instrumental in helping to draw up our first long list of people to be commemorated in the Long March to Freedom, a list that is still consulted today. He has contributed greatly to the development of the biographical panels that accompany the sculptures now standing in Fountains Valley, and corrected many an error in historical fact, grammatical turns of phrase and political jargon. Of particular importance to him was the burning desire not to whitewash history, and even when commemorating, to tell the whole story. He never shied away from revealing weaknesses, whether in an individual or in an organisation, but always put these in their greater context, because at heart he always wanted people to get the fuller picture. Not the headline stuff, but the much more interesting nuanced and complex ‘sub-events’ that give rise to the more known bigger events. Although not born in South Africa, he deeply loved this country, and knew its history better than most. 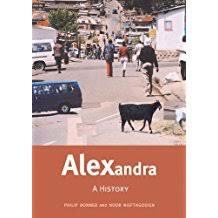 He is a loss to the Long March to Freedom, but we have no doubt that our research team and researchers in the future will continue stumbling across his work and use it to great effect when rewriting South Africa’s history. 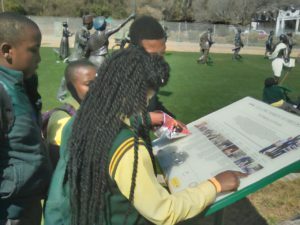 We received our first big school tour on Friday from the Ekukhanyiselweni Christian School in Tembisa, who were blown away by their unusual visit to this unique outdoor history class. History teacher Daniel Joseph took his class to visit the Long March to Freedom as part of one of their history assignments. The 23 students were each given one of the almost 100 sculptures on site to research and spent a long time getting to know the sculptures and their role in South Africa’s history. 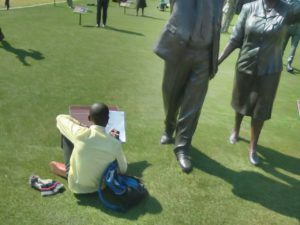 The Long March was littered with learners sitting or standing next to info panels that gave a brief biography of the many liberation heroes of South Africa’s 350-year struggle to democracy. 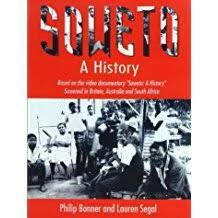 Among the favourites were Shaka, King of the Zulus, Solomon Mahlangu, martyr from the 1976 Soweto Uprisings, and South Africa’s first democratically elected president Nelson Mandela. 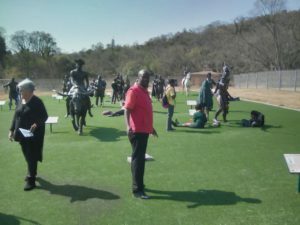 With tour guides Alfred Mahapa and Tumo Bopape, the students walked through a procession of some of the country’s most inspiring icons in this unique heritage park. All schools are welcome to visit the Long March to Freedom which is open from Mondays to Sundays. For more visitor information, visit our website. Get in touch for a guided school visit.